Today I want to take a look at Michael Bay's movie The Rock and examine how Bay uses conflict to keep our eyes on the screen. At the time The Rock (1996) was released several critics were less than kind. Though generally positive in his comments, Roger Ebert pointed out that the movie borrowed from: The Fugitive, Bullitt, Escape From Alcatraz, The Third Man, Alien, Die Hard and Pulp Fiction. "No matter. Director Michael Bay ("Bad Boys") orchestrates the elements into an efficient and exciting movie, with some big laughs, sensational special effects sequences, and sustained suspense. And it's interesting to see how good actors like Connery, Cage and Harris can find a way to occupy the center of this whirlwind with characters who somehow manage to be quirky and convincing. There are several Identikit Hollywood action stars who can occupy the center of chaos like this, but not many can make it look like they think they're really there. Watching "The Rock," you really care about what happens. You feel silly later for having been sucked in, but that's part of the ride." Roger Ebert, to my surprise, gave The Rock 3.5 out of a possible 4 stars. Here's why I think Michael Bay's movies work: Conflict. Namely, the expert management of sustained conflict. In any case, as I watched The Rock I thought about Winkle's article, Five Ways to Add Conflict to Your Story, and thought about how these tips/tricks could be seen in Michael Bay's work. For example, Winkle writes: "Conflict is what makes a story interesting." And I think that the success of The Rock supports that point. For example (spoiler warning) the last scene of the movie has Stanley Goodspeed (played by Nickolas Cage) running from a chapel towards a beaten up old car. The car has a "just married" sign taped to the back and tin cans have been attached to the bumper via string. Stanley's bride--still wearing her white wedding dress--is behind the steering wheel watching for her husband. Stanley bursts out of the chapel pursued by a cleric who passionately accuses him of filching something. Cage hops in the car and his bride floors it. The car shoots forward, trailing streamers and a host of tin cans. As the car pulls away Stanley examines the package he absconded with: a roll of microfilm. The tiny package holds the governments most guarded secrets: Who shot JFK? Do aliens exist? And so on. The scene is very short. The needed information is communicated--Stanley found the microfilm--but what could have been a fairly dull scene was turned into a spectacle, something that didn't give the audience the opportunity to look away--not that we wanted to. And how did Michael Bay accomplish this? Through conflict. Through spectacle. The conflict: the cleric pursuing Stanley. The spectacle: a cleric chasing a groom out of the chapel he was just married him. Their getaway car trails paper streamers and tin cans. That has to be the worst getaway car in the history of movies! But that's just it, the whole thing is over the top. Cage finding the microfilm could have been dull. It's not like at the end of Indiana Jones and Raiders of the Lost Ark where we see the warehouse that seems to stretch to infinity, providing another (similar) hint of mystery. It is as though the movie says: here are the secrets worth knowing. And then they are placed beyond our reach. In my post on Wednesday I'll talk about Chris Winkle's article, Five Ways to Add Conflict to Your Story, and explore how inserting conflict into an otherwise lackluster scene can help make it pop. - Roger Ebert's review of The Rock. - Michael Bay - What is Bayhem? - Five Ways to Add Conflict to Your Story by Chris Winkle. 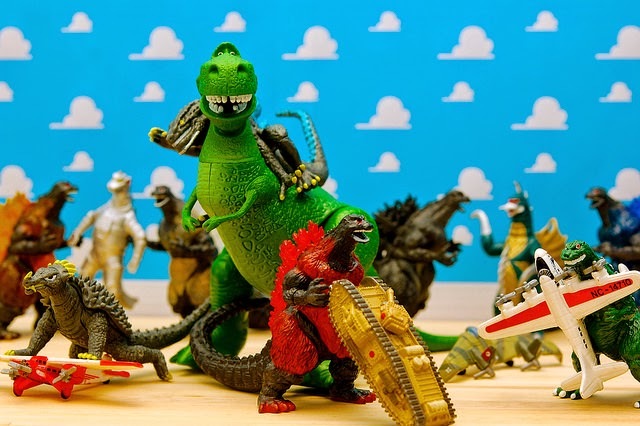 Photo credit: "Kidzilla Babysitting" by JD Hancock under Creative Commons Attribution 2.0.